Just when things were looking up for the Force, they have another bump in the road. After winning three consecutive games, the Force fell to the Kansas City command last week who only won one game coming into the contest. The Force looked to bounce back against the New Orleans VooDoo at the Gwinnett Arena on Saturday night but could not get anything going offensively which led to a 57-35 loss. The VooDoo came out swinging as quarterback Kurt Rocco found Quorey Payne for a 30-touchdown strike on the first play of the game. The VooDoo got the ball back second later after Force quarterback R.J. Archer threw an interception to Demarcus Robinson. That led to a Rocco 2-yard touchdown pass to Josh Bush to give the VooDoo the 14 -0 lead. The Force did score on the ensuing series as Archer threw a 6-yard touchdown pass to C.J. Johnson, but the VooDoo came right back with Rocco 1-yard touchdown run. The Force got a much needed score to start the second quarter when Archer found Jake Allen for a 1-yard touchdown pass. But the offense for the VooDoo was on fire as Rocco found Bush for a 29-yard touchdown pass to take the 27-14 lead. The VooDoo scored again with 18 seconds left in the half when Rocco threw a 13-yard touchdown strike to Brad Paul to go in to halftime with a 20 point lead. The Force got the momentum back to start the second half when wide receiver Larry Shipp scored on a 1-yard touchdown run. 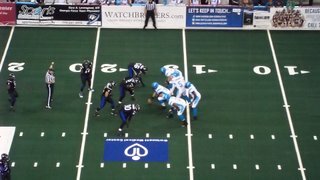 Rocco would give the momentum back to the VooDoo, throwing two touchdown passes in the third quarter to give them the 47-21 lead. Rocco would throw his last touchdown pass of the game when he found L.J. Castile for a 10-yard strike with 11:36 left in the fourth quarter. The Force retaliated when Archer threw a 2-yard touchdown pass to Shipp. The Force would get the ball back when they recovered the onside kick and on the next play from scrimmage, Archer threw a 42-yard touchdown pass to Shipp to cut the VooDoo lead to 21. The main reason the Force lost to the VooDoo is the offense continues to have issues. Archer, who did not play last week because he was at his wedding, struggled to get anything going. He finished 26-of-50, with 286 yards, four touchdowns and three interceptions. With the 35 points scored by the Force, this makes it the eighth time this season they don’t score over 50 points. Archer’s counterpart, Rocco, was on point the entire game. Rocco finished 21-of-24, 293 yards and seven touchdowns. He was named Playmaker of the Game. Rocco’s go-to guy, Bush, was named Offensive Player of the Game and he led all receivers with seven catches, 119 yards and three touchdowns. Castile also performed well for the VooDoo, catching nine passes with 107 yards and two scores. The Force (6-6) now drop to second place in the American Conference South Division and are half a game out of first place which is now held by the Jacksonville Sharks. But don’t worry because the Force will play the Sharks (6-5) next Saturday at the Gwinnett Arena. The last time these two got together was back in March when the Force dominated the Sharks 69-41.